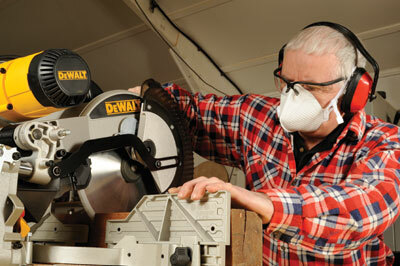 Every carpenter or cabinetmaker needs to be able to accurately and quickly crosscut and mitre timber. 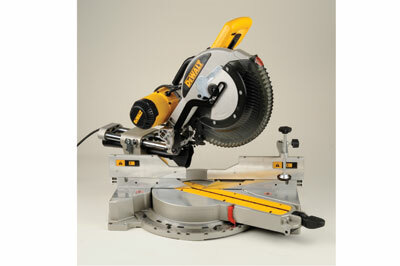 A well set up compound mitre saw is the ideal way to achieve both. So is the new DeWalt DWS780 the perfect answer? We set Anthony the task of checking to see if this saw is really up to the mark. The DWS780 is yet another iteration of a DeWalt compound mitre saw, this time having quite a large capacity and several clever touches to aid repetition cuts and exact settings. It is big and heavy whatever DeWalt may say about portability. 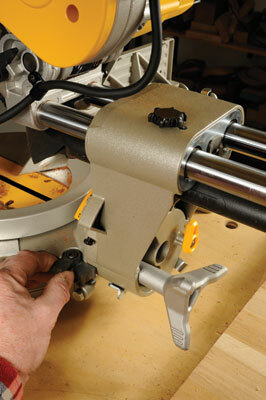 It can be mounted on to the DeWalt work stand which allows for the cutting of long lengths. This saw has the now familiar XPS shadow line cut indicator which is claimed to be more precise than a laser guide. So using this shadow cutting device and being able to adjust all settings on the saw is critical for this to be an accurate representation. It sports a hefty 305mm dia., 60-tooth blade powered by a 1,675 Watt motor via a drive belt. This gives an overall 90 degree cut capacity of 110 x 303mm at 90 degrees. It is possible to set mitres beyond 45 degrees which is essential with awkward walls etc. Bevel cuts are made by loosening off a large tri-pointed knob at the rear and setting against a scale at the front. Normally it only does this to the left. To bevel to the right you operate a knob that allows the saw head to swing over to the right. The saw assembly can be locked at any point on the slide rails although there is a special flip-back catch to hold the saw at the optimum point for deep cuts. The cut quality is good and the capacity huge. The sliding fence portions are high, necessary for large scale workpieces such as cornice mouldings. To fit the work clamp you need to slide a fence section aside first so it locks in the socket. Overall this piece of kit is capable of quality results but heavy to hump around.